Ever wonder what’s the proper age to start brushing your kid’s teeth? Some moms say that at 2 is best, others say the moment they start eating, while other moms say that as soon as the teeth comes through, brushing is recommended. Brushing their teeth is required especially if your kid sleeps with a bottle or sippy cup on her mouth. The milk or juice sits on their teeth and are changed to acid by bacteria in their mouth. This can cause major problems such as tooth decay that can interfere with good nutrition and even speech development. To be really sure, let’s take it from the experts. Dentists highly recommend cleaning a baby’s tooth is best as soon as the first one appears. This happens when a baby is six to seven months old and does not necessarily mean “brushing” but cleaning the tooth and gums using a gauze pad to remove plaques. Once this is practiced, your little one will develop the habit to brush his teeth at an early age. Kids, by their nature, like to imitate the older ones. Parents must use this opportunity to encourage them to start brushing their teeth on their own as they get older. This is actually a kid’s greatest desire ~ to look and act like mom and dad. Naughty, frolicsome, and uncooperative ~ this is usually a parent’s struggle for their kids to concentrate when brushing their teeth. But worry not, there are some tactics that we can give you for them enjoy and have fun while brushing their teeth. 1. Choose the toothbrush correctly. Select those that are with characters, colorful, light and soft-bristled. These are usually available in your nearest supermarkets. 2. Be the model. Let your kid watch you while you brush. Capitalize on telling him that doing it is “just like mom or dad”. Take advantage of this time to be also your play time. When your child catches the spirit and grabs your toothbrush, it’s time to get the toothbrush you bought. 3. 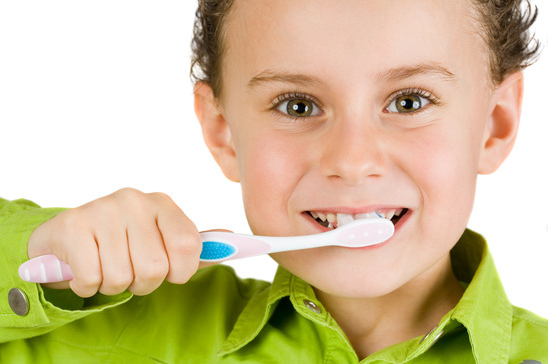 Put tiny (pea-sized) fluoride on his toothbrush and show that you did it on your brush, too. Then start brushing on your teeth as he will imitate your actions afterwards. Perform this at least twice a day: one in the morning and one in the evening. 4. Don’t expect children under three to clean their teeth well on their own. Usually at the start, your kid will struggle on holding the toothbrush properly. That’s perfectly normal even if it will take him a little more time to have the perfect grasp. Practice, practice, practice. Patience, patience, patience. 5. The simplest and easiest position when teaching him to brush his teeth is for you to sit on your knee with their head resting on your chest, holding his hand for proper position while you both watch your reflection in the mirror. With an older child, you can stand behind him, put his hands on the proper angle and let him brush his teeth while watching yourselves in the mirror. 6. Show them the ways to brush teeth for beginners: first in small circles covering all surfaces, you may also teach him to include some portion of his tongue and encourage him to spit the toothpaste out afterwards. Gargling with water afterwards is not recommended as this rinse the fluoride. Ensure proper supervision of your kid while doing this. He may get the toothpaste tube and lick its contents. 7. For day to day brushing teeth together, singing a jingle from a toothpaste commercial is best. A tune like “Brush, brush, brush, three times a day, brush, brush, brush cavities away” or even from the “Row, row, row your boat” is encouraging enough for him to stay relaxed and take time to brush his teeth until the song is over. 8. Have the determination to do this until you’re sure that they can do it correctly. Kids taught on proper brushing of teeth at an earlier age usually learn the habit and performs it correctly at around six to seven years old. Although your kid’s teeth are temporary this time, having it cleaned regularly makes a difference because these teeth hold the exact spaces for the permanent teeth that will come out later on. Aside from that, if tooth decay happens, it will cause him pain, be very costly to treat, and worse, can even lead to life-threatening infections. Remember: Tooth decay can be prevented. Brushing their teeth while their young is a great way to do so. With the right care, your kid can grow up to have healthy teeth that will give him more confidence to give a lifetime of smiles.